In what follows are various notes and algorithms dealing with points, lines, and planes. 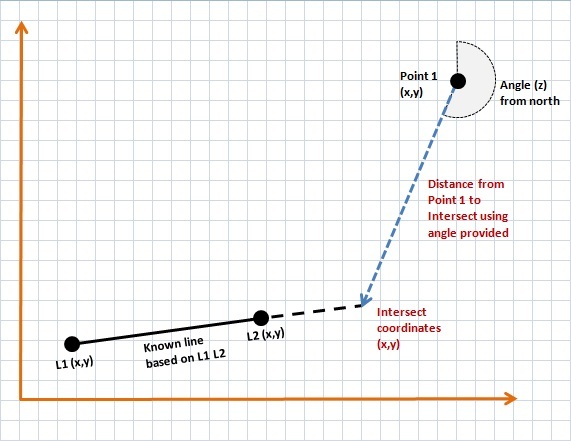 The distance therefore between the point P3 and the line is the distance between (x,y) above and P3. If the distance of the point to a line segment is required then it is only necessary to test that u lies between 0 and 1. The solution is similar in higher dimensions. Let Pa = (xa, ya, za) be the point in question. To derive this result consider the projection of the line (Pa - Pb) onto the normal of the plane n, that is just ||Pa - Pb|| cos(theta), where theta is the angle between (Pa - Pb) and the normal n. This projection is the minimum distance of Pa to the plane. Substituting equation 3 into equation 2 gives the result shown in equation 1. This note describes the technique and algorithm for determining the intersection point of two lines (or line segments) in 2 dimensions. The denominators for the equations for ua and ub are the same. If the denominator for the equations for ua and ub is 0 then the two lines are parallel. If the denominator and numerator for the equations for ua and ub are 0 then the two lines are coincident. The equations apply to lines, if the intersection of line segments is required then it is only necessary to test if ua and ub lie between 0 and 1. Whichever one lies within that range then the corresponding line segment contains the intersection point. If both lie within the range of 0 to 1 then the intersection point is within both line segments. Original C code by Paul Bourke. C++ contribution by Damian Coventry. LISP implementation by Paul Reiners. C version for Rockbox firmware by Karl Kurbjun. C# version by Olaf Rabbachin. VB.net version by Olaf Rabbachin. Two lines in 3 dimensions generally don't intersect at a point, they may be parallel (no intersections) or they may be coincident (infinite intersections) but most often only their projection onto a plane intersect.. When they don't exactly intersect at a point they can be connected by a line segment, the shortest line segment is unique and is often considered to be their intersection in 3D. The following will show how to compute this shortest line segment that joins two lines in 3D, it will as a bi-product identify parallel lines. In what follows a line will be defined by two points lying on it, a point on line "a" defined by points P1 and P2 has an equation. The values of mua and mub range from negative to positive infinity. The line segments between P1 P2 and P3 P4 have their corresponding mu between 0 and 1. The above can then be expanded out in the (x,y,z) components. There are conditions to be met at the minimum, the derivative with respect to mua and mub must be zero. Note: it is easy to convince oneself that the above function only has one minima and no other minima or maxima. These two equations can then be solved for mua and mub, the actual intersection points found by substituting the values of mu into the original equations of the line. Contribution by Dan Wills in MEL (Maya Embedded Language): source.mel. A Matlab version by Cristian Dima: linelineintersect.m. This note will illustrate the algorithm for finding the intersection of a line and a plane using two possible formulations for a plane. If it is necessary to determine the intersection of the line segment between P1 and P2 then just check that u is between 0 and 1.
where all points (x,y,z) lie on the plane. The normal to the plane is the vector (A,B,C). Given three points in space (x1,y1,z1), (x2,y2,z2), (x3,y3,z3) the equation of the plane through these points is given by the following determinants. Note that if the points are collinear then the normal (A,B,C) as calculated above will be (0,0,0). The sign of s = Ax + By + Cz + D determines which side the point (x,y,z) lies with respect to the plane. If s > 0 then the point lies on the same side as the normal (A,B,C). If s < 0 then it lies on the opposite side, if s = 0 then the point (x,y,z) lies on the plane. where . is the dot product between the two vectors. The intersection of two planes (if they are not parallel) is a line. Where "*" is the cross product, "." is the dot product, and u is the parameter of the line. Taking the dot product of the above with each normal gives two equations with unknowns c1 and c2. A contribution by Bruce Vaughan in the form of a Python script for the SDS/2 design software: P3D.py. The intersection of three planes is either a point, a line, or there is no intersection (any two of the planes are parallel). The denominator is zero if N2 * N3 = 0, in other words the planes are parallel. Or if N1 is a linear combination of N2 and N3. 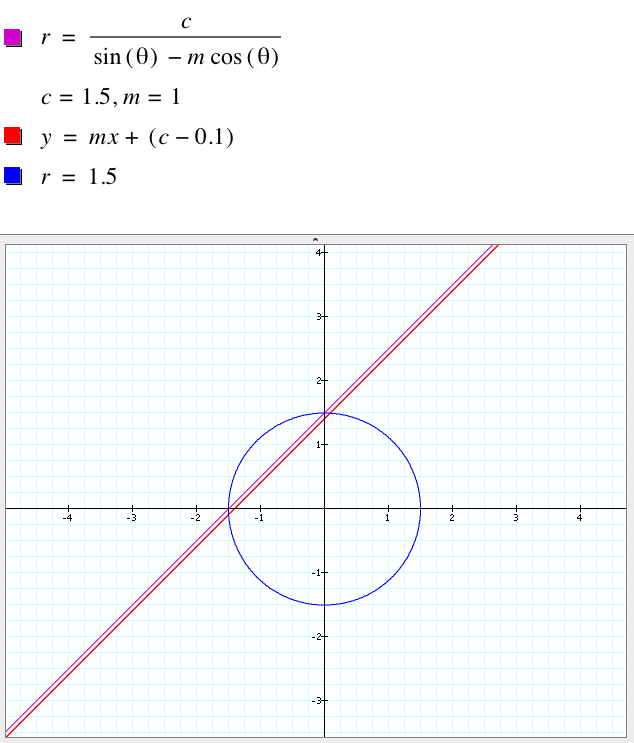 How might one represent a line in polar coordinates? The derivation is quite straightforward once one realises that for a point (r, theta) the x axis is simply r cos(theta) and the y axis is r sin(theta). Substituting those into the equation for the line gives the following result. Example from the Graphing Calculator. Given a line defined by two points L1 L2, a point P1 and angle z (bearing from north) find the intersection point between the direction vector from P1 to the line. Short answer: choose a second point P2 along the direction vector from P1, say P2 = (xP1+sin(z),yP1+cos(z)). Apply the algorthm here for the intersection of two line segments. Perform the additional test that ub must be greater than 0, the solution where ub is less than 0 is the solution in the direction z+180 degrees.